In Vancouver on November 14-15, Canada will host the United Nations Peacekeeping Defence Ministerial forum —a key event for UN peacekeeping. One goal of the forum is to “elicit new pledges from Member States to close key capability gaps for UN peacekeeping operations.” Another is to build on the “3Ps (pledges, planning, performance) with an added emphasis on partnerships.” According to leaked reports obtained by The Canadian Press, countries that attend the forum must first make a pledge. However, Defence Minister Harjit Sajjan has resisted the idea of making a new pledge, declaring that such “announcements” don’t make an “impact.” “How many years have some of the conflicts been going on, right?” he asked. What do we feel when we hear such a statement from a seasoned soldier, who has seen firsthand the ravages of protracted conflicts on individuals and families and societies? Years of delay have very real outcomes. Time is a luxury many in conflict zones simply do not have. Moreover, it is not clear when Canada will fulfill its 2016 promise to provide more peacekeeping troops. In 2016, Canada made a pledge to bolster UN peacekeeping with some 600 soldiers and 150 police officers. Prime Minister Justin Trudeau has indicated that a final decision on the 2016 pledge won’t come until after mid-November. Last week he said, “We will take the time necessary to do it properly.” The Defence Minister also indicated that time is needed to consider how to contribute to UN missions that have a “tangible impact.” But time is passing and promises are not being kept. In the meantime, civilians continue to face violence, injury, and death. The Canadian government does appear to be considering a proposal championed by former senator and lieutenant-general Roméo Dallaire: the creation of a unit that would focus on the de-militarization of child soldiers. The number of children being exploited in different conflicts is growing. In Yemen, we know of at least 1,700 children, some as young as 10, who have been recruited to fight. According to Dallaire, all current conflicts use children as weapons. We would welcome the news that Canada is going to help to protect children forced to participate in war. But it can do much more. Peacekeeping is at the heart of Canada’s national identity. 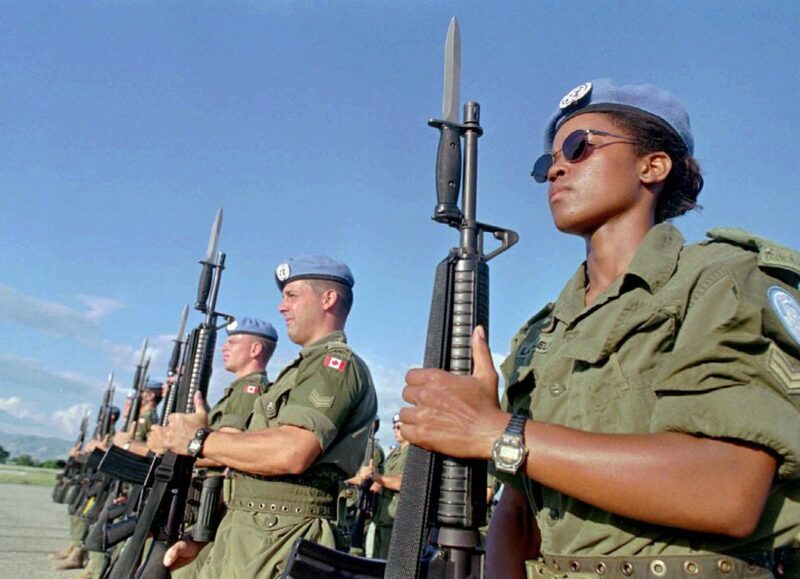 Not so long ago, Canada was ranked among the top contributors to UN peacekeeping missions. As of June 2017, it ranked 71st out of 127 countries. This apparent lack of willingness to commit has not gone unnoticed by the global community and Canada’s bid for a coveted seat on the UN Security Council in 2021 will surely be impacted if no real commitment to the UN is seen. We may well see a repeat of 2010, when Canada lost the seat to Portugal.